WHEN Sam Johns and her daughter Sheila set off on a 400-mile round trip from Camden Town to Manchester on Sunday night, it was to close the book on two years of turmoil. The family, along with a dozen other medical experts and witnesses from London, made the long journey to the General Medical Council’s headquarters by train. Travel and their stay at the Radisson Edwardian hotel was paid for by the GMC, but this was no luxury trip. “I am being made to feel like I am the victim,” said Ms Johns during the hearing. There were a couple of times during the tense cross-examination by Dr Singh’s legal team that she left the room in anger at the nature of the questions. 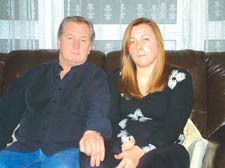 Tony Jago, Ms Johns’ ex-boyfriend and Albie’s father, was supposed to give evidence via video link on Monday. But the taxi-driver, who has been off work since Albie’s death, suddenly changed his mind and drove up in his cab. “I just want to get this over so I can start getting on with my life,” said Mr Jago. The panel had heard how the Mr Jago has been plagued by nightmarish visions of baby Albie and is on medication following three strokes in the last two years.